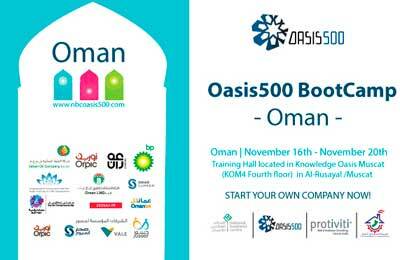 Global consulting firm Protiviti’s Middle East member has organised the first Oasis 500 boot camp in Oman in co-operation with the National Business Centre. The camp makes a milestone in the co-operation between business incubators across the region where Protiviti has played a key role in bringing together NBC Oman and Oasis 500 Jordan to deliver a regional experience to Omani entrepreneurs, said a statement. It will run for a period of five day at NBC starting on November 16. The participants will undergo an intense journey to transform their ideas into business projects, it said. Shatha Al Maskiry, managing director of Protiviti Oman, said: "We are honoured to be the catalyst of this co-operation that will not only serve the Omani entrepreneurs, but also enrich NBC's team experience through information exchange with the Oasis team.